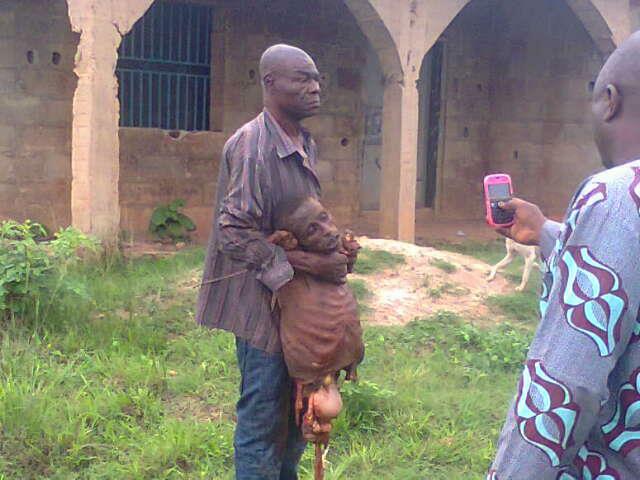 A man from Ilesha town, in Osun state, Inspector Ajayi who was a prison officer before he retired was recently caught selling human parts. The whole of Oke-Opo area in Ilesha Osun State was thrown into panic some days back when the human butcherer and parts seller was apprehended by the Police after tip off by the residents of the area. The man in the picture below was caught in the act while dis-membering an unknown man. See pic after the cut...VIEWER DISCRETION IS HIGHLY ADVISED! Why Will A Man Do This To His Wife? Why?